Cold, in more than one way. The venue - Seaside House - is very enthusiastic about its state of the art air conditioning. As a result I'm freezing as I sit in the seminar room, then get beaten up by a wall of humid heat once we step outside. When you go back in the sweat and humidity condenses and chills you even further. And now I've caught a real cold, with sore throat, aching joints and all. The AC is partly to blame but of course, if you grab forty people from all over the world and stick them in one building for three weeks you're creating a great breeding ground for any virus that happens to pass by. Happily, Japan allows the sale of over-the-counter cold medications that could club an elephant so I feel reasonably symptom-free at the moment - though not particularly alert, or rational, or awake. Student and tutor in a discussion about his project. The seminar rooms have glass walls that are perfect as whiteboards. Lunch buffet. The food is good. Problem is, it's pretty much the same food every day, morning, lunch and dinner. I think I might have actually lost a little weight these three weeks, simply because I really can't summon much enthusiasm for the meal times any more. A typhoon passed by to the west of us; we caught only the edge of the storm zone, fortunately. We got some dramatic weather changes as it cleared up. We're coming up to the end of the second week at OCNC, and I'm starting to feel a little cooped up. We spend every day in the same building, with the same people, working, discussing and going to lectures. It's a beautiful building and fascinating discussions, but after two weeks you do wish for a bit of change. 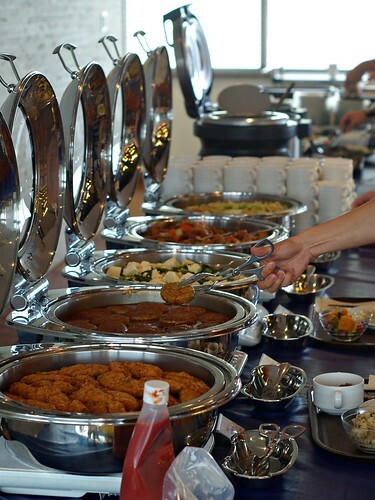 The food - buffet delivered from a nearby hotel - is excellent, but buffets can only be so varied. We're in a semi-rural area so there's really nowhere to walk and there's nowhere you can go without a car. Most of all, though, I miss Ritsuko. Two weeks is a long time to be apart. I miss making dinner together, talking about our day in the evening, walking through Osaka on a weekend. Life is much better when she's around and I get unhappy when she is not. Don't read this wrong; being here is immensely rewarding. I'm very happy that I get to spend these three weeks at the summer school. But I'm also happy that it's three weeks only, and that I'll be back in Osaka before long. We had sunday off, and went on a group excursion to Churaumi aquarium north of here. I haven't been to many such places, but I have a hard time believing there are many others as impressive as this one. We had two hours and that was not nearly enough. Four hours would have been much better, and I could happily spend a whole day there given the chance. 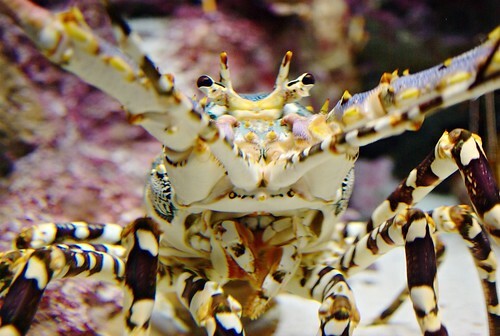 There are many, many small tanks throughout the aquarium, with sea-living insects, amphibians, coral reefs and, as here, crabs. Photography is explicitly allowed as long as you don't block access for other people, but of course, you're shooting through thick acrylic glass and the tanks are generally not well lit so getting a good, well-focused image is a challenge. 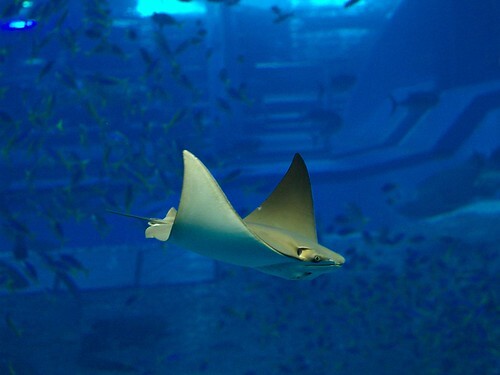 A ray at the large sea tank. The large shark tank is ridiculously large; I didn't bring a wide enough lens to actually show the entire wall. 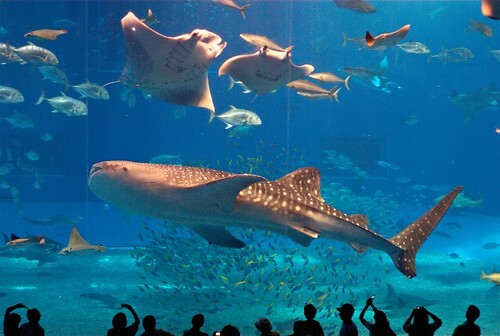 There's space enough for a couple of whale shark in addition to all the normal-sized sharks, rays and various fish. 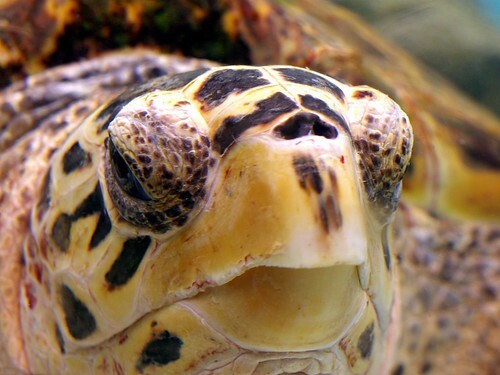 There's a small sea turtle exhibition off away from the main building. Not as well presented, I think, but it does give you a fairly good look. One of the main jobs of the tutors at OCNC was to give afternoon tutorials on various simulation software; general tools like Python and Matlab as well as specialized packages such as NEURON and Nest. The students use those software packages for their own projects so the tutorials have all been crammed into the first week. Preparing and holding the tutorials have eaten up a lot of time, but now they're all done and life here is settling down a little bit. We are of course helping the students with their projects but now there's time again for some of our regular work. I've poked at my simulation code for the first time in a week, and a few of us found time to go to nearby Maeda point for a bit of snorkeling. I have to get fins and a good underwater camera. Things start fairly late here; breakfast is from before eight and the sessions don't start until 9:30. I get up before seven as usual, and that gives me some free time in the mornings. Many people go swimming in the morning, and it's a good time to take a walk along the beach before the morning shower and breakfast. 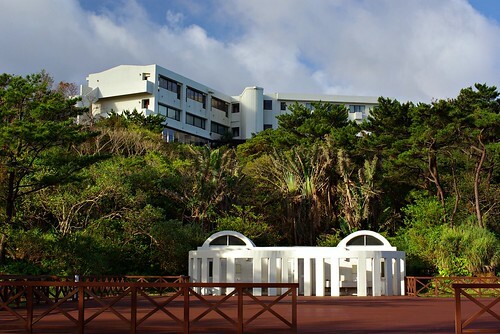 The main campus is in the mountain away from the coast - sensible, considering the constant risk for typhoons - but Seaside House, the conference building, sits on the cliffs overlooking the beach. This is the kind of view we have to put up with during the theoretical sessions. Truly, woe is me. Lots of small life along the beach itself. 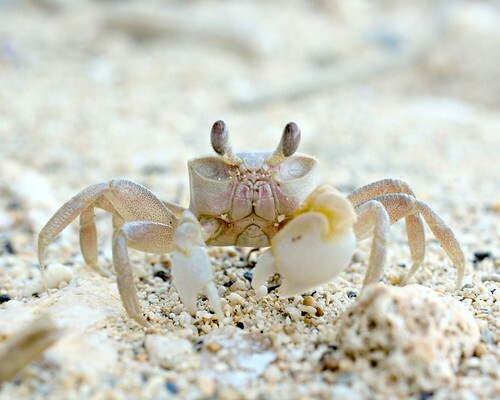 Here a small (~3cm) crab kindly froze for long enough for me to get a picture. 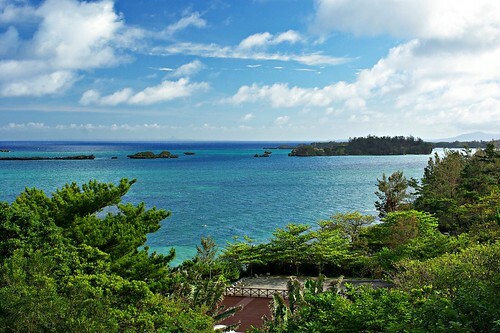 I'm going to Okinawa tomorrow - yes, again, but this time it's all work, not play. I'll work as tutor at the OCNC summer school at OIST for the next three weeks. Every year OCNC brings together graduate students and post-docs for a three-week intensive course in computational neuroscience. There's a series of lectures by some of the big names in the field, tutorials on commonly used software tools and the students work on a project of their choice. I use the NEST simulator quite a lot, so my job will be to introduce it to the participants, and to help the students that use NEST for their own projects. It's also a great opportunity for me to follow the lecture series, learn about other software tools and techniques, talk with other neuroscience modelling people and generally learn a lot of new stuff. Of course, I'll still work on my "day job" - my ongoing project - while I'm there. I've been running ragged trying to get everything prepared in time; that's partly why posting has been light lately. It's not just the tutorials; I've also tried to bring my project to a point where I can easily work on it away from my desk. I'll try to make a point of writing shorter posts while at OIST that don't take me so much time to finish. Nazar is a good Turkish restaurant in Shinsaibashi, Osaka. We go there now and again, though not very often - we unfortunately don't have the time to go anywhere regularly. The owner opened another restaurant in Umeda some time ago so the food can vary a fair bit depending on who is working in the kitchen at the time, though I'm sure the menu will settle eventually. They celebrated an anniversary a few weeks ago, with a buffet, drinks and belly dancing. It was fun: the food was good, the belly dancer managed to really engage the audience, and the people were interesting. 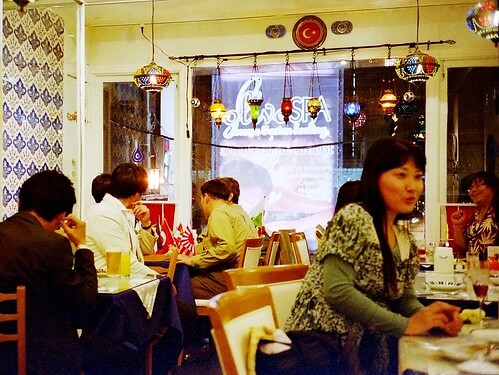 The interior is pleasant, with plenty of Turkish accents without ever falling into kitch. The bellydancer - Japanese, by the way, not Turkish - got people up and dancing along with the music. And no, it was not a costume party. 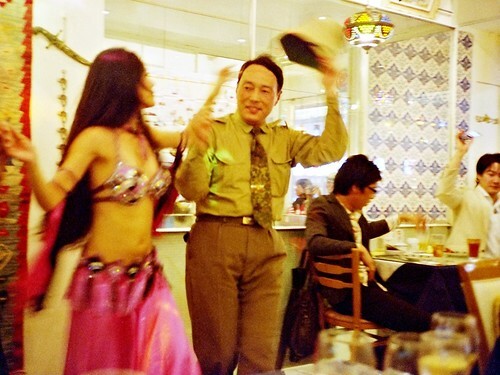 Bellydancer, part of the buffet, and in the background Atatürk. It's not a big restaurant. One group of regulars are military otaku, with an eclectic mix of mostly European uniform pieces - the pike helmets are Polish, apparently, and the white flowerpot thing is colonial British. One of them sported a monocle and an iron cross. We had no idea what they were about at first; Ritsuko thought they could be comedians still in stage costume, while I thought they might be right-wingers that'd lost their minds. 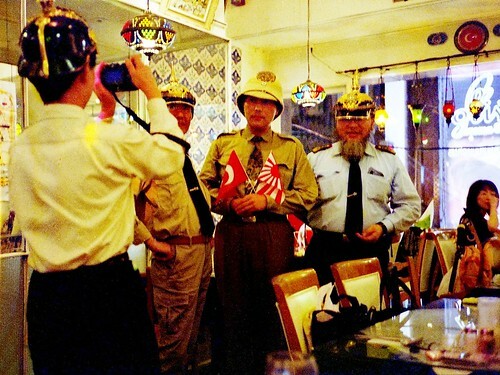 But no, they simply dress up in uniform and meet over dinner from time to time. As a fellow geek I certainly understand and sympathize with such an obsession in general, even while I'm firmly opposed to the tasteless idea of treating military items as something positive or worth glorifying. 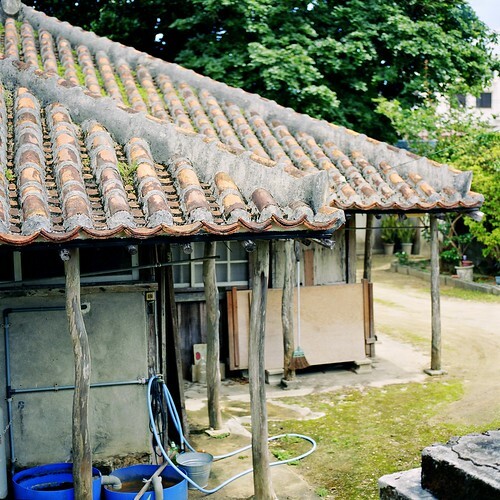 Our trip to the Yaeyama islands, in pictures. The weather wasn't great - usually cloudy and occasional rain - so we didn't get any bright, shiny white-sand-blue-skies type of pictures. 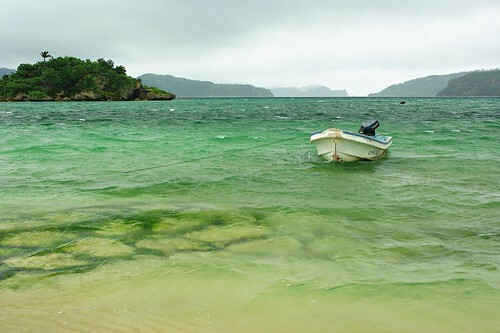 That doesn't matter; we had mild climate with perfect temperatures, and the sea and the jungle-covered islands became if anything more appealing with the sense of mystery and drama tropical rains brought with them. 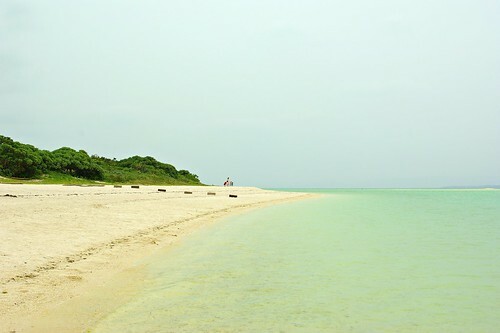 Taketomi is mostly known for its quaint village atmosphere, and for its beaches. Kondoi beach is packed with people on sunny days; when it's raining you get it mostly to yourself. 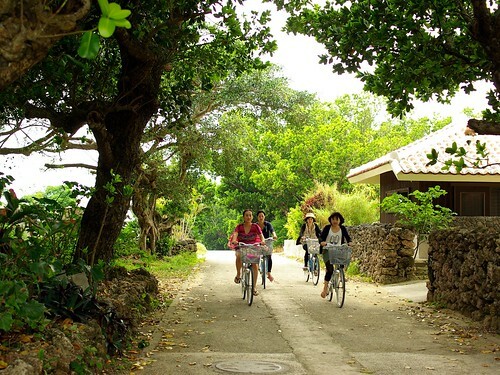 Taketomi is small and flat, so the preferred way to get around is by bicycle. You can rent a bike almost anywhere, and if you stay overnight the hostel has loaner bikes for its guests as well. 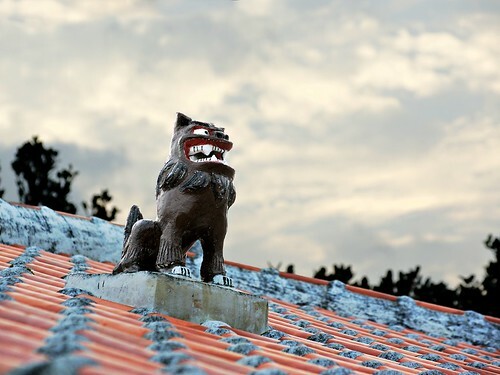 Shisa like this one adorn many buildings in Okinawa, and were traditionally thought to ward off evil spirits. 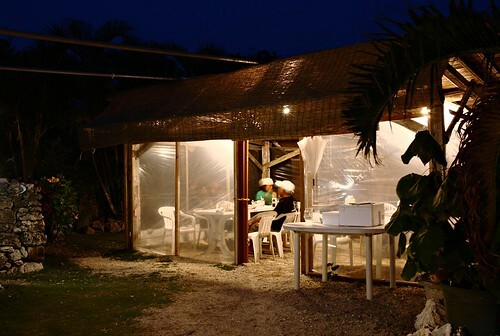 "Taruria" is one of a number of restaurants on Taketomi, and is frequented by locals as well as tourists. The fried shrimp set and the goya stir-fry were both delicious. 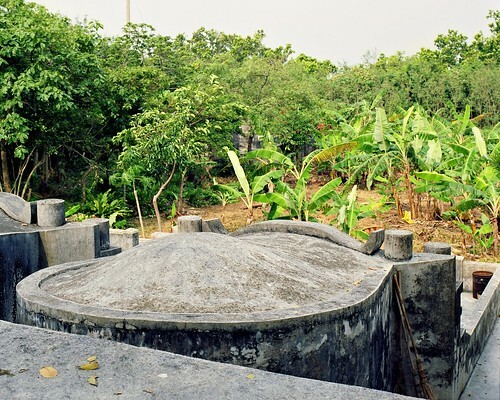 The local tombs have a unique style that reflects the local burial customs. Whole clans are interred in the same tomb, so you need plenty of space. 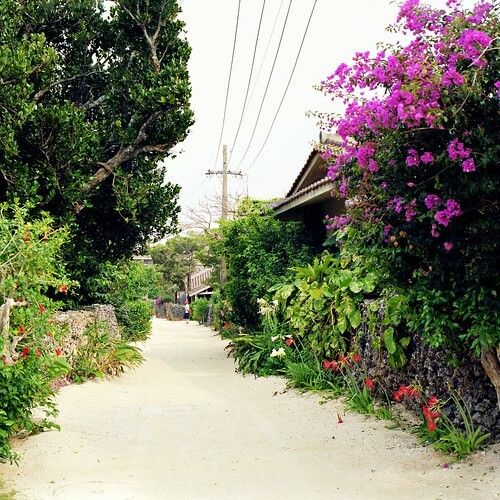 Taketomi village is crisscrossed by sand and gravel streets bounded by low stone walls, all overflowing with tropical greenery. The atmosphere remains relaxing even when the streets fill up with tourists on bicycles. Bad weather often means good scenery. 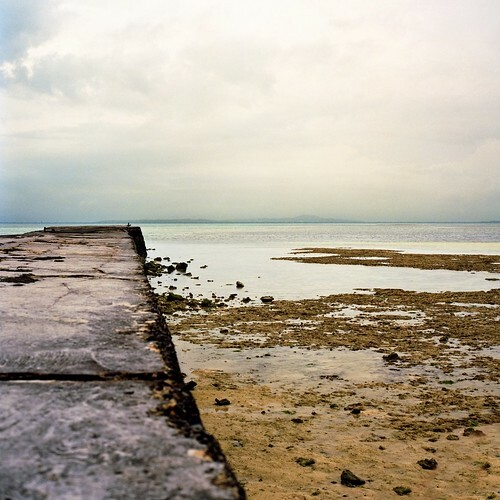 This pier is just north of Kondoi beach on Taketomi, and completely abandoned when it rains. The weather is unpredictable. We had everything from rain to sunshine, often within the same hour. 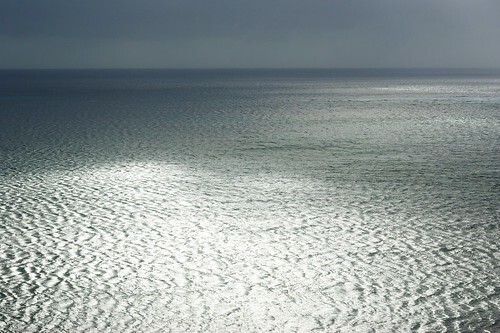 The sea does look better in wet weather. 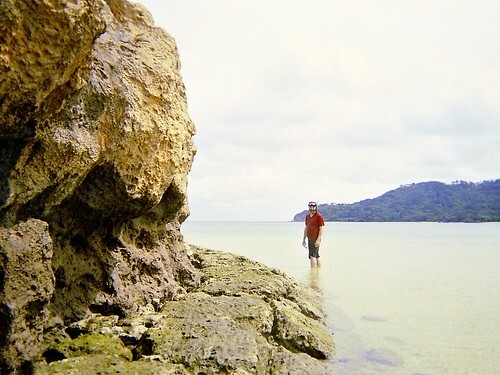 The beaches tend to be shallow, and the tide is very obvious. We went snorkelling and beach-combing just outside the village. Here Ritsuko has captured me having a Cousteu-moment. Snorkelling was an amazing experience. We didn't even get fins, and never ventured far from the shore. I had a blast simply floating on top of the reef edge, observing the variety of corals and small lifeforms and waiting for the fish to line up for a picture. Or we walked along the rocky shore, poking at the driftwood and junk from around the world and observing the tadpoles and tiny fish bustling in the shallow low-tide pools. Clownfish are absolutely everywhere. 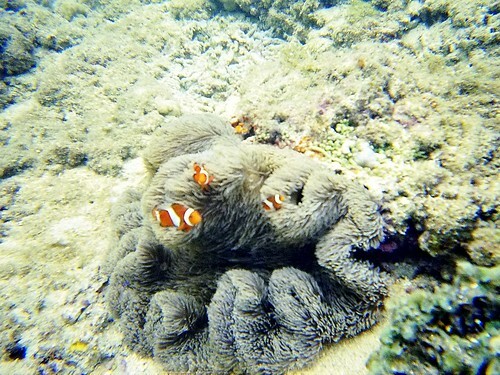 Anywhere you find a sea anemone you can be sure there's be a few clownfish looking out at you. We brought a Fuji recyclable camera, an underwater version of *this*. The camera really was a positive surprise. I expected little more than a grainy, unfocused, blue-tinted mess. What we did get (after scanning and postprocessing) are pictures that are quite decent for use on the web like this, or for making small prints. This. This is the whole reason to come here. 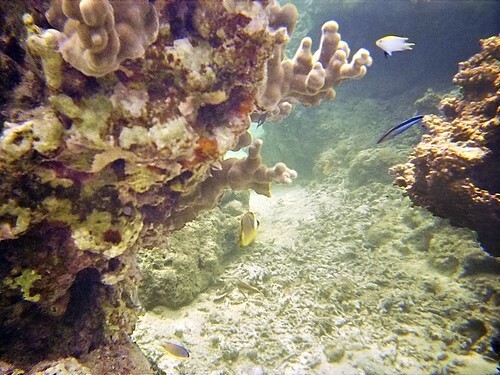 We were wading along the beach to the small cape, where the bottom suddenly dropped and the coral reef began. And it was like being dropped head-first into a BBC nature production; a riot of colorful fish, corals, anemones, invertebrates... David Attenborough swimming by for some running commentary would have made a perfect fit. I'll need to get fins next time. Probably open-heel ones, so I can wear boots underneath for wading along the coast. 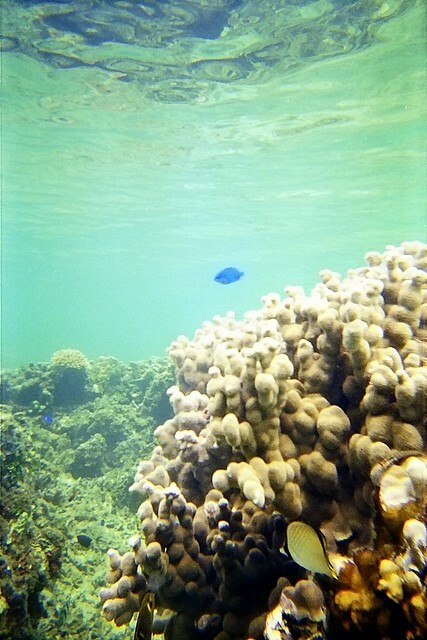 I'll also need a better underwater camera at some point, but that's difficult. Many digital compact cameras seem to get worse results than the Fuji; a DSLR with underwater housing is much too big and much too expensive; and if there are any housings for compact film cameras I can't find them. The Nikonos V seems like a good option, but is fairly expensive and seems high maintenance. 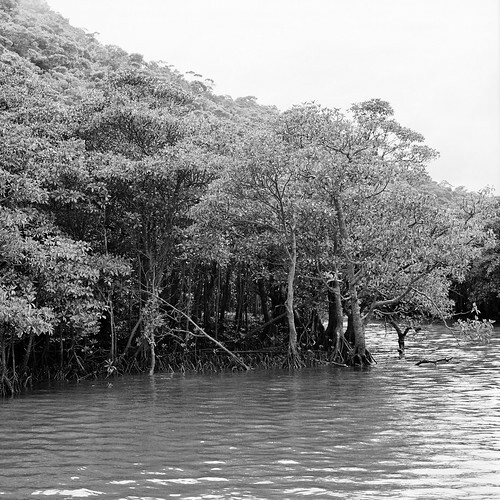 The rivers in Iriomote (it's a big island and has several sizeable rivers) are lined with dense mangrove forests. The river and jungle tour was fun. 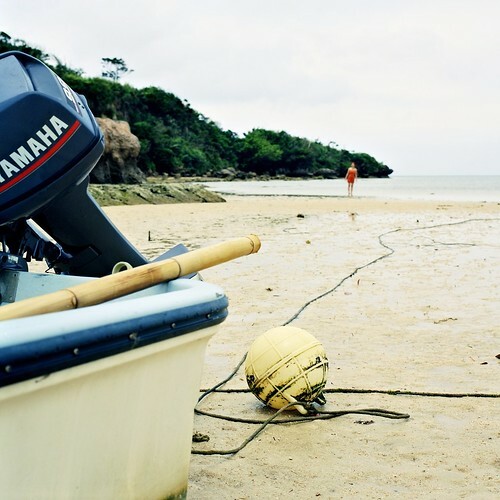 You go to a landing at the mouth of Urauchi river, just a quick ten minutes from Iriomote village and board a tour boat that takes you upriver. 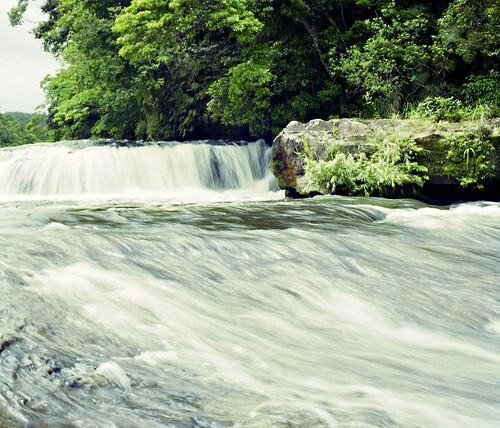 From there you walk about half an hour to a viewing platform overlooking the first falls. If you add another twenty or thirty minutes you can reach the Kanbire falls, which is a lot more interesting than the viewing platform. The tour operator allows you to "skip" your scheduled return boat and catch the next one instead. Just be careful you don't miss the last boat. 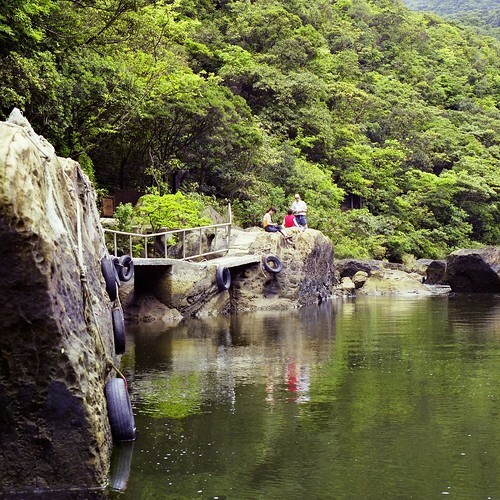 The river tour ends at this landing, and the footpath to the waterfalls begins. Now, it is a path, with gravel in places and small bridges for crossing over streams, and all kinds of people, from small children to senior citizens, were happily following it. But it's not a road by any means. It's steep, muddy and wet, and you'll have to climb over largish boulders and across tangled root systems. If you slip in places you'll have several meters to fall down to the riverbed below. If you rely on a cane to get around, say, or if you have trouble bending your knees then this walk is not for you. And bring good, sensible clothes and shoes - at the landing we saw one heavy guy in shorts, flip-flops and a bagful of beer; and one girl with more fashion than common sense in a frilly skirt and very high heels, and I doubt either of them managed to finish the walk. The Kanbire falls are not high; a series of low cliffs with the river rushing by. It makes for easy access, and some people were wading and even swimming in spots. After the tour we grabbed the bus to Iriomote Onsen on the northeast side of the island. Very good - large pool, both outdoor and indoor baths and saunas. 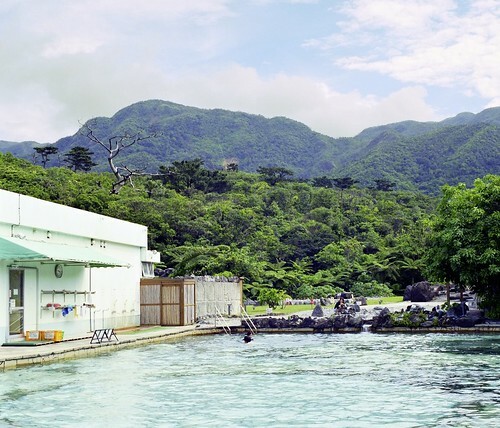 There's separate facilities for men and women, and a common bathing area. A perfect place to wash off the mud and relax for a few hours. 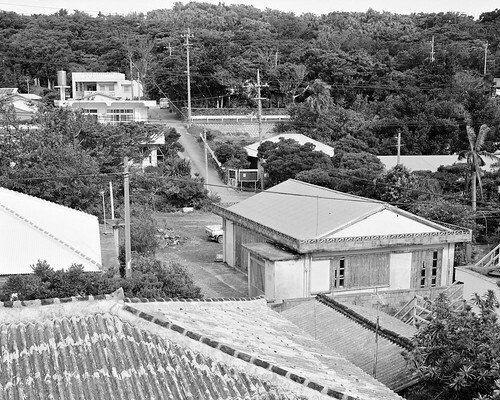 Iriomote village on the west coast is tiny; you can walk across it in ten minutes. It does have three beaches within walking distance, a school and a post office, and the islands only Ramen place, run by a diving enthusiast from Tokyo who moved here with his family to be closer to the diving areas. The Ramen is really good, by the way, the kind of place I'd often go to if I lived nearby. We stayed at Iriomote Island Hotel. 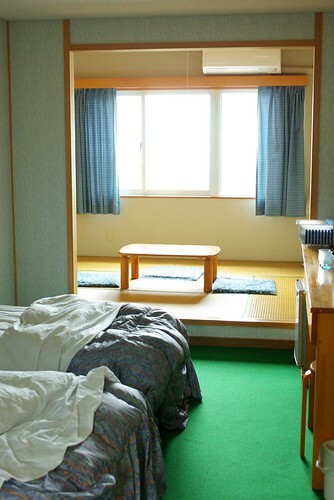 It was a pleasant experience; the rooms are quite large and well maintained, and breakfast and dinner (both included) were tasty and plentiful. As it happens, the 123°45'6.789" longitude runs by the village, and somebody with a very pleasantly geeky personality streak decided it needed a monument - and no monument to geekery is complete without a laser. 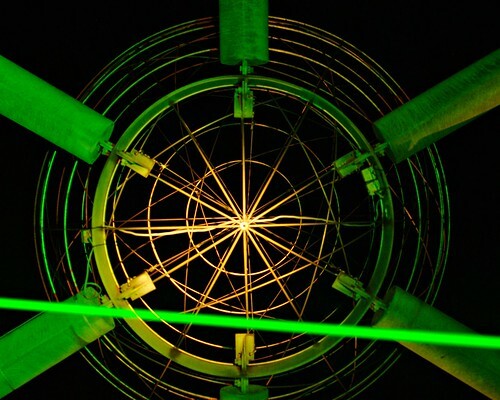 Every night the green laser shoots up into the sky to mark the path of the longitudinal line. The world needs more stuff like this. 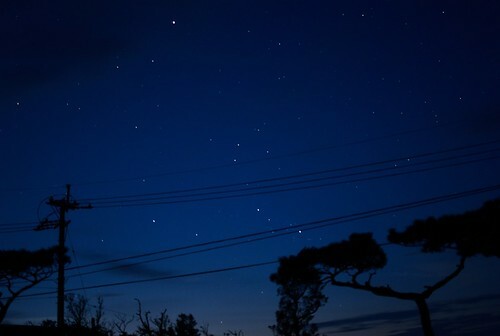 On a clear evening the stars come out. You never see them like this in Osaka. Ishigaki city on Ishigaki island is a fair-sized place, about 45 000 people in all. Like most regional cities the economy is evidently not great, but there's a variety of fairly good restaurants and water holes and fishing and diving boat operators seem to be both plentiful and busy. This kind of out-of-the-way place has always had a hard time attracting business, but I keep wondering if something like a software business wouldn't be viable nowadays? Rent and living expenses are low, most business-related communications go over the net, and Kansai and Kanto are both just a few hours away by air should you need to go someplace in person. 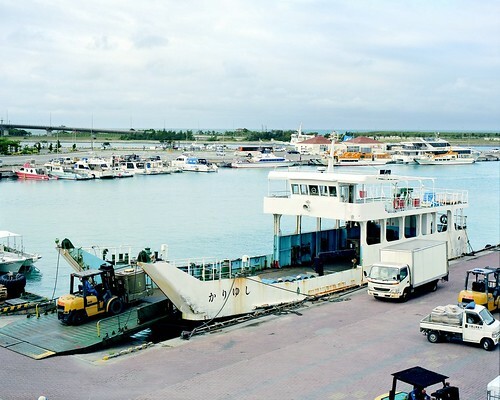 Ishigaki harbour is the main transport hub for the island chain. Most travel and just about all freight pass through here. A couple of large freighters connect from Okinawa a couple of times a week, and small freight ships pass back and forth to the other islands every day. These Roll-On-Roll-Off freighters is the transport lifeline to Taketomi, Iriomote and all the other islands in the area. They seem to bring anything and everything, from heating oil and gasoline to foodstuff to packages to live cattle. It seems a little romantic and a lot of fun to work on such a ship, but the reality is - as always - probably rather mundane. 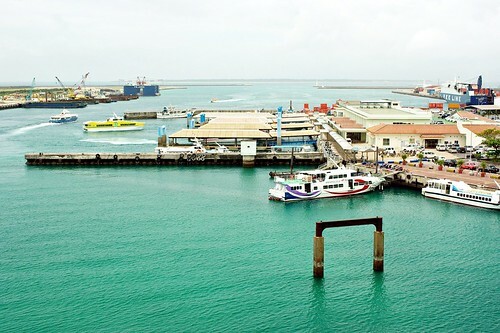 The harbour-facing side of the city has office and apartment buildings, shopping streets and restaurants. But walk up the other way and you find quiet streets with older, charming single homes. 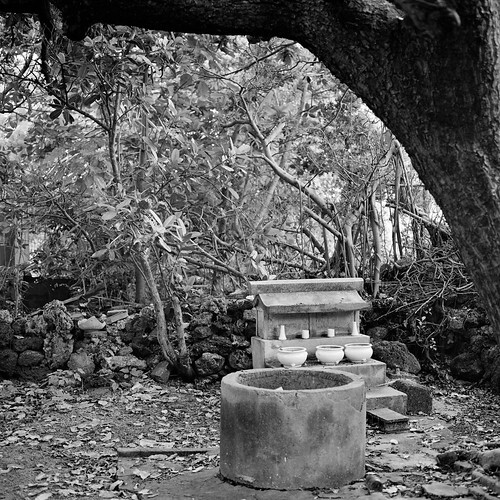 A small shrine in an overgrown vacant lot. 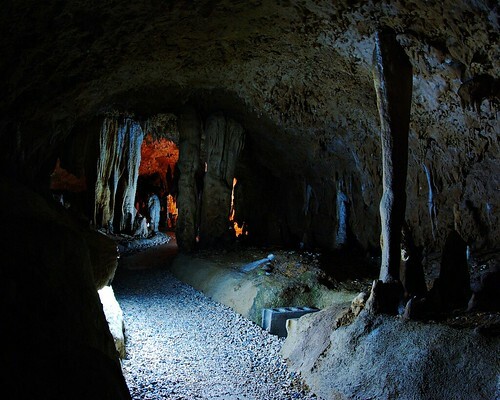 There's limestone caves in the hills north of the city, and they're open to visitors. There's a good variety of scenery, and it's a really pleasant visit to cool down from the early summer heat. 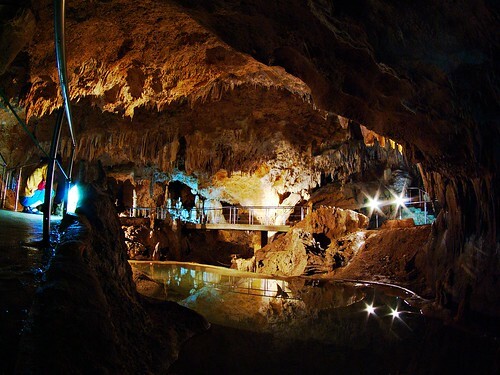 The caves aren't exactly natural anymore. It's all well lit and the pathway is extensively prepared, with stairs, gravel, railings and head protection. And this being Japan there's plenty of signs and recorded guide messages along the way. But it doesn't get intrusive, and of course it makes for an easier visit. 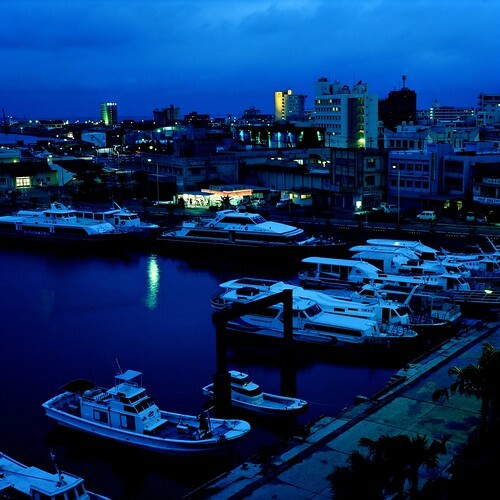 Ishigaki harbour at dusk. Ferries, diving boats and fishing boats have stopped for the night, and only a seafood restaurant is still open along the waterfront. Do I want to go here again? Oh yes. Stay for a bit longer than a scant week? Absolutely. It's a bit out of the way, and the flight is relatively expensive, but it's worth it, no doubt at all. The full set is here. In the end, Ozawa withdrew his support for the no-confidence motion. Without his support it stood no chance; the motion was defeated 293-152. The LDP and to some extent the New Komeito are arguably losers in this. The no-confidence motion would have happened in any case, largely as a symbolic raspberry to the sitting cabinet1, but with Ozawas possible, then probable support it took on real meaning and the LDP leaders invested a fair amount of their political capital in seeing the motion pass. Kan is, well, not the loser he looked to become just this morning. He had to promise to resign as soon as the Tohoku disaster situation and Fukushima stabilizes, but he was well on his way out already and would not have survived politically beyond that point anyhow. Yukio "I-must-have-left-my-brain-in-the-other-suit" Hatoyama optimistically predicts mid-June for a leadership change; when you look at the progress in Tohoku and in Fukushima I would not be surprised if he stays until September. And with the no-confidence motion behind him he is guaranteed to break the one-year barrier with his prime-ministership, and become the longest-sitting prime minister since Koizumi. The Japanese public and the Japanese political system are both losers - but they were the moment a few bright bulbs decided that several hundred thousand citizens in refugee camps and an ongoing nuclear disaster is a perfect time to plunge the country into (worse) political disarray. The big mystery to me is Ozawa; is he a winner or a loser in this sorry charade? Perhaps he overplayed his hand; he realized he didn't have the numbers to topple Kan and elected to withdraw rather than follow through and get kicked out into the political wilderness. On the other hand, he made the LDP look foolish (there is no love lost between him and that party) and extracted a promise to resign from the prime minister. My bet is that he tried and lost. The current result is a bit of a consolation prize, nothing more. Now, nothing has really changed. The Kan cabinet will still fall soon; the DPJ will still fly apart in the not too distant future; the LDP is no more ready to rule again than they were a year ago; and nobody has any clue, nor much interest in, breaking out of the political deadlock the country has been stuck in for the past decade. #1 This is considered normal, ethical behaviour here. A lot of Japanese politics resemble nothing so much as a schoolyard of spiteful 7-year olds. The opposition parties have submitted a no-confidence motion against the government. By itself it's kind of a pointless gesture, and a bit hard to understand; they don't have the votes to make it pass, and they've been getting plenty of criticism for wasting time with this. The DPJ government has been making the expected hash of things of course, but the opposition has also been obstructing things at every turn. But Ozawa is urging his followers to vote for the no-confidence motion. In a by now familiar pattern, when he realizes he won't be Prime Minister within his current party he leaves and takes his followers with him, and damn the consequences. It's unlikely that he'll be able to round up the 86 DPJ rebels he'd need to topple the Kan government, but the DPJ leadership (what's left of it) has stated that anyone voting for this motion will be expelled from the party. This includes at least five fairly high-ranking party members. Effectively, the DPJ is splitting down the middle. MTC argues that this is the end of the DPJ. While it's likely the end of the DPJ as an amorphous big-tent alternative to the similarly sprawling LPD, I'm not as sure it's the end of the DPJ party brand. The rebels are unified mostly in their fealty to Ozawa himself, but to some extent the rebelling diet members all share an ideology beyond that as well. Ozawa has tended to recruit candidates that can subscribe to his vision of Japans political future. They'll leave, and, I guess, either try to build a new party together with a rump of members from the LDP; or possibly try to merge with another existing party. But that also means the remains of the DPJ are free of a long-running ideological and personal split. The DPJ, like the LDP, has never really made much sense, with members representing almost every conceivable point on the political map. The remaining DPJ will possibly be a fair bit more unified in its political outlook, and with less personal acrimony to thwart coherent policy-making. And of course the same thing can be said of any future Ozawaist party; if they manage to create a viable organization then it, too, should be able to present a clearer alternative to the voters than its members ever could as part of the DPJ. The New Komeito, Everybody's Party, the long-established small parties all have a coherent ideology of sorts (though the Social Democrats and the New Komeito seem to share "being in power" as a major part of it). That leaves the LDP as a sprawling "everything-for-everyone" big-tent party. But LDP support is more and more concentrated in the rural Japan, areas that have been losing population and influence for a long time now. They rely on a voting district division that gives disproportionate power to rural areas at the expense of urban Japan, but the supreme court has recently ruled this discrepancy as illegal and unconstitutional. It is very likely that the LDP power base will be substantially reduced when the redistricting happens. That disruption will hopefully be enough for LDP members to split into more coherent parties as well, and will in any case lessen the LDP influence no matter what. We might see the beginning of the end of the current Japanese political system. A good thing in the long run. Hopefully. Edit: MTC reports the rebels may have the needed votes, and Kan may be ready to resign. In any case, that doesn't really change the longer-term outlook; the party is falling into pieces, the question is simply who owns what piece.